In part 2 of Laughter and your body, we explore a further 5 physiological benefits of how laughter makes it “great medicine”. Improves breathing (respiration) and blood circulation. Under normal conditions a small amount of air stays in your lungs which carries more carbon dioxide and moisture. Laughing forces you to expel all the air in your lungs getting rid of excess carbon dioxide and moisture. It also loosens up and helps you expel mucus and phlegm. 10 minutes of laughter can result in two hours of pain relief. This occurs it releases two neuropeptides endorphins and enkephalins – the bodies’ natural pain-suppressing opioids. The Tasmanian Arthritis Foundation has incorporated laughter into its support groups. Lowers blood pressure. Ten minutes of laughter therapy reduces blood pressure by 10-20 mm. A good massage for your organs. Laughter has been likened to internal jogging – it gives your organs a good rub around. Happiness, laughter and love of friends are as important to protecting us from heart disease as keeping cholesterol under control and taking an aspirin. A researcher at the University of Maryland, Michael Miller, recommends at least 15 minutes of hearty laughter a day to ward of heart attack. 15 minutes of it relaxes arteries and raises blood flow for up to 45 minutes – comparable with aerobic exercise. – Tim Scally, comedian and laughter leader. Tweet that! Kataria, D.M.,Laugh for No Reason. 2002, Mumbai: Madhuri International. Know more about laughter and how it makes your body healthier than ever. Contact us: info@laughterworks.com.au, or + (61) 438 545 607. The workplace can be a very stressful environment. Different personalities are forced to work together to accomplish objectives, sometimes under very tight deadlines, and everyone has an opinion on how the work should be done. Stress can come across as hostility towards others. Hostility and defensiveness at work get in the way of productivity and the ability of each person to give their best work. How can you avoid stress and hostility in the workplace? The answer may surprise you: workplace laughter. When people are stressed and angry, it will be hard to find something to laugh about, but that’s where workplace laughter sessions come in. This sessions are group meetings where laughter and yogic breathing take place for an hour, lead by a professionally trained Laughter Yoga teacher. You don’t even need a reason to start laughing: just simulate it and the real laughter will follow, especially if you have others in a group to laugh with you, as it is notoriously infectious. 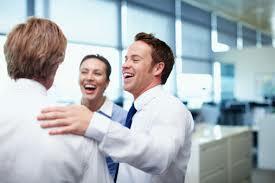 How Do Laughter Sessions Improve The Work Environment? 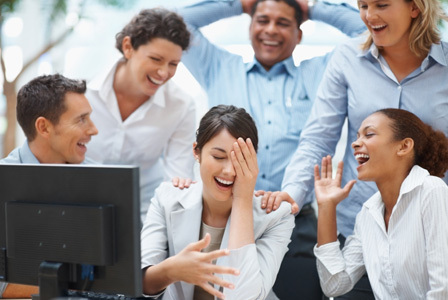 Laughter sessions are a great form of team-building, uniting staff to share in a common experience that will give them a renewed sense of wellbeing and focus to tackle the next project. When everyone is in a happy mood after sharing endorphin-filled workplace laughter, they will be able to calmly communicate with each other to accomplish objectives without getting stressed over deadlines. Like any team-building exercise, they are designed to bring people together. Laughter is clinically proven to reduce stress hormones in the body, making it easier for the body to channel the energy of stress into something more positive: supporting the immune system. When employees are happy and healthy, the work will get done and everyone will interact harmoniously. Studies show that after just three weeks of laughter sessions, staff morale and performance improved significantly, so don’t wait—work with laughter yoga sessions today and get ready for a happier workplace. That’s easy – just get in touch with Laughterworks and we’ll organise something for you. We have laughter leaders in each state in Australia. Book a laughter session for your next conference or workplace event. Contact us: info@laughterworks.com.au, or (+ 61) 438 545 607.